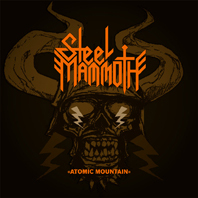 Right on the heels of the Nuclear Barbarians EP I reviewed some time ago Steel Mammoth, the harbingers of NWOFHM release their first full-length. Led by Circle’s Jussi Lehtisalo the band swears in the name or true 80’s heavy metal, although there is also a bit different stuff on this album. The album begins with some hard rocking. “Black Team” is monotonic pounding with harmony vocals. The vocals on the chorus remind me of Glenn Danzig… There is also some guitar soloing at times. This is a really tight opener! “Heart of Bone” is a bit more laid-back number in the 80’s metal vein. “Midnight Witches” that was also played on their debut gig comes next and this hypnotic track grows into a total exorcism towards the end. One of the album’s best tracks is the kraut-styled “Blackout Leather” that has a rockier chorus. Also “Nuclear Barbarians”, another kraut-styled, straight-forward and excellent number that was already released on the band’s first EP, rocks very well. The least heavy track on the CD is the long, repetitive, almost instrumental “Commando Leopard” that has at first some small-scale, weird vocals. Before three minutes have passed the rhythm fades out completely, and experimental, psychedelic and strange noise follows for a long time. The comp returns after the nine-minute-marker and there’s some growling and squeaking in the end. A very weird number! The mid-tempo and simple “Riders of Death” has a powerful chorus with some backing vocals as well. The track has a bit of soloing and even a C part. In the end there is some screaming guitar and it gets pretty psychedelic. The NEU!-like rock piece “Metal Infant” has very funny lyrics and nice soloing. This rather fast song rocks really well! The album closes with its most peaceful ballad called “Atomic Mountain” and it’s a quite melancholic and beautiful number. This is a very good album that includes both real dedication to the cause and metal cliché humour, and these together form a very tasty soup. The band’s music may work even better in a live environment when the energy charge is as high as possible. You can find a bit more information from the band’s MySpace site at http://www.myspace.com/steelmammoth.